Definitely there are many people who are not surprised that Sherlock Holmes has much to do with the USA, but this information may be new for those who are not familiar with Conan Doyle’s original stories and with the fantastic world of the great detective. In most movies and film adaptations the sleuth lives in London, though in some stories he visits America. For example in Sherlock Holmes in Washington with Basil Rathbone, in Sherlock Holmes in New York with Roger Moore, and Jonny Lee Miller’s detective also lives in New York in CBS’s Elementary. We have to note that the Sherlock Holmes movies starring Robert Downey Jr. are English-American coproductions. So it is worth it to deal with Sherlock’s American references. The topic is relevant because of the fact too that thanks to BBC’s Sherlock, starring Benedict Cumberbatch and Martin Freeman, countless teenagers became Holmes fans, who, as they are young, have not yet read Doyle’s original novels and had not seen older adaptations. Certainly there are true Sherlockians among them, but the majority is jonesing the handsome main characters, the events or the Johnlock fantasy world. It is important to mention that it is one of the biggest misbeliefs that Holmes and Watson had romantic feelings towards each other. Conan Doyle, the creator of the detective was aware of the fact that homosexuality exists and had nothing against it, but he did not wanted his heroes to live together as a couple. Respecting and accepting homosexuality is sincere and honest only when heterosexuality is also respected and accepted vice versa. So we have to respect that according to Doyle John Watson was heterosexual, he had been married to a woman. Humanity would die off without heterosexuality. We also have to respect the asexuality of Sherlock Holmes – the eccentric sleuth lives solely for his profession. As he says in A Study in Pink, he is married to his work. Not regarding Holmes gay means we respect the outstanding work of Sir Arthur Conan Doyle. We, the creators of the site do not deny that most of our visitors are from the United States. The majority of the participants of our BBC Sherlock - The Return of Jim Moriarty game were also American. What is more, the second society that became our partner is The Nashville Scholars of the Three Pipe Problem from the USA. (You can visit their site by clicking on this link: nashvillescholars.net) With this article we would like to express our gratitude and respect towards our American visitors. Since the Sherlock Holmes stories are more than 120 years old, it is impossible to list all their American references. We try to name the most important ones. The USA adopted, liked and even improved the figure of Holmes, so it is rightful to call him an English-American character, an American symbol and a national treasure. Furthermore Doyle was a real pry, who loved to discover the world and was up-to-date with its happenings. No doubt that he received lots of information via newspapers, books, telegrams and personal talks. It is clear that he spent a lot of time with collecting data. This way he improved his literacy, his social life and also gained inspiration for his writings. Conan really liked the world, the different people and cultures, so in the Sherlock Holmes stories he speaks about several nations: Irish, Italian, French, Czech and Hungarian (Recommended article: Sir Arthur Conan Doyle and Hungary). It is often mentioned in connection with the author that he created so interesting and realistic figures and exciting stories. By listing so many countries he found his way into the hearts of many people and made them proud of their origins. America was important for Doyle. When he arrived to the States in 1922 to held lectures on spirituality, he received such a warm welcome what was a great honour and a fantastic experience for him. But he could appreciate American talent long before that. He was a general practitioner, and though he modelled Holmes mostly after his Scottish professor Joseph Bell, he named the sleuth in honour of the American Renaissance man and doctor Oliver Wendell Holmes, who was an excellent surgeon and observer, just like dr. Bell (More information: The name of Sherlock Holmes). Doyle had many American friends, and one of them, the famous illusionist Harry Houdini was born in Budapest, the capital of Hungary, but he took up his residence in the USA and then he told everyone that he was born there. So Doyle knew Americans, and he even stated that his hero would search Jack the Ripper in the United States when he was asked about the Whitechapel murders and about what would Holmes do to solve the case. As a matter of fact investigating in America was not alien for Sherlock Holmes. Lots of people think he is the lonely genius who feels fine solely at his Baker Street home and who moves to the country only when he has some mystery to solve. According to the Canon Sherlock spends most of his time at home, but when his services are needed, there is no distance for him. This flexibility and his fieldwork is what distinguishes him from his brother Mycroft, who is also a genius, but is too lazy to detective work. Sherlock never denied that his brother’s abilities are even brighter than his and he would make the most brilliant detective of the world yet the older Holmes does not like fieldwork. Mycroft scarcely goes anywhere else than to his own home, to his workplace or to the Diogenes Club (Though Mycroft is more active in recent adaptations: in BBC’s Sherlock, in CBS’s Elementary and in the Guy Ritchie movies too.). His brother is more flexible, more adaptive and more energetic. Sherlock travels the world to solve crimes and to hide from Moriarty’s gang. Following the example of the original, many authors placed their hero to locations outside England. So the Baker Street genius was and still is a global phenomenon. Several stories of the Canon have American connections – crimes are committed or clues lead there, and the detective often receives telegrams containing crucial information from his American colleagues. Later Doyle's younger son, Adrian published his own Sherlock Holmes stories in Collier's Magazine. The co-author of these stories was John Dickson Carr. It is evident that Holmes is connected to the United States through his creator, Conan Doyle, but we owe the fact that we know and love him as he is portrayed in the Canon not just the famous author. An excellent American actor, William Gillette helped bringing Sherlock to life again and even improving his figure. Conan Doyle was a true genius who gladly showed his talent in numerous genres of literature. Though the stories of Sherlock Holmes made him world famous, his historical novels have higher value for literateurs. It is an interesting fact that Winston Churchill liked these works very much. The curious author who lived an active life, wanted to concentrate on his historical novels and other pieces instead of continuing the adventures of Holmes. That is the reason why the detective’s life ended (for a while) at Switzerland’s spectacular Reichenbach Falls. As this turn of the events resulted in mourning and outcry over Great Britain and America, publishers and fans of the sleuth harassed Doyle, and even his mother Mary was against the idea of killing off Sherlock. So some time later the detective came back from his death and had many new adventures. Sir Arthur kept on this monotonous task, but there was someone to help him: American actor William Gillette, who took the road and visited the author to ask his permission to some changes in the life of Holmes for a stage play he wrote. When he listened to the story, the famous writer began to like the pipe-smoking tenant of Baker Street again. He even allowed Gillette to marry Sherlock onstage. William and Arthur became lifelong friends, and the Scottish writer saw his friend in the play many times and he always enjoyed his performance. The piece was so popular that it was shown in England and in Scotland too, and in the United States extra performances were held. But there were many other American actors who played the great detective, for example John Barrymore, Charlton Heston, Larry Hagman, Matt Frewer, Leonard Nimoy. Conan Doyle published some of his Sherlock Holmes stories in American magazines. Though The Strand Magazine reached the States before that, so the eccentric sleuth was already popular when his adventures came out in the country’s magazines. In London such great illustrators portrayed Holmes like Sidney Paget or Frank Wiles, whose works became legendary. 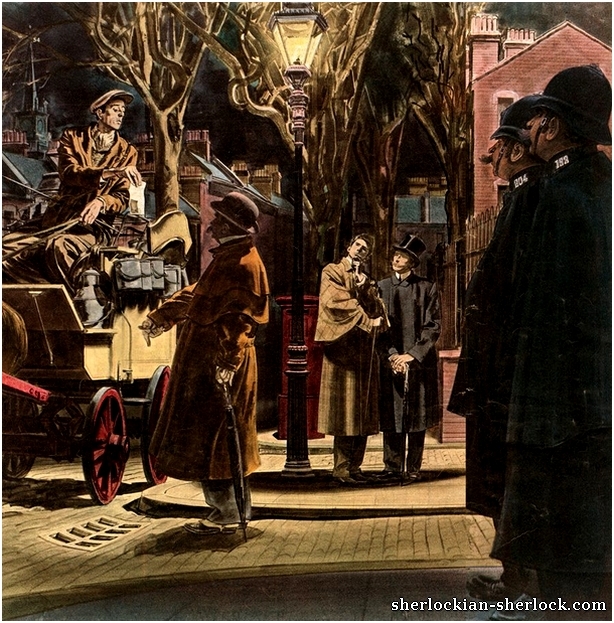 The USA can also rightly be proud of its artists who made illustrations of Sherlock: Frederic Dorr Steele, Arthur Ignatius Keller or Robert Fawcett. The latter won the honorary title „the illustrator of illustrators” while still alive, because his style was so delicate. His pictures were beautifully detailed but not cheesy. His Sherlock drawings were his most popular and most acclaimed works. Definitely his hand was lead by his love for the characters. The world famous Sherlock became an industry soon in Doyle’s life, and this business flourishes since then. The great detective is very profitable not only for movies and films, but for theatres, museums, magazines and souvenir makers too. America is in leading position among the manufacturers of Sherlockian memorabilia, and the library of the University of Minnesota owns the richest Holmes collection in the world. The collected adventures of the sleuth were published in many wonderful editions. In America the broadcasting of Holmes radio plays began earlier than in England (More information: Sherlock Holmes on Radio). It is also a significant fact that the USA has the most Sherlock Holmes clubs and societies. In the above we tried to collect some evidence to justify how gladly the United States welcomed and adopted the detective, and how faithfully it treasured and still treasures his memory. According to a saying the greatest gifts for a child are unconditional love, arms wide open and attentive ears. The USA gave these all to the fictional Holmes, whom we respect so much that we talk about him as if he was alive. Undoubtedly the greatest detective of the world returned the love for the Americans – they can meet him almost every day onscreen, onstage, on the pages of books or in the form of a souvenir in the land of the Declaration of Independence. Did you know? Irene Adler was American. Irene born in New Jersey in the 1850s.